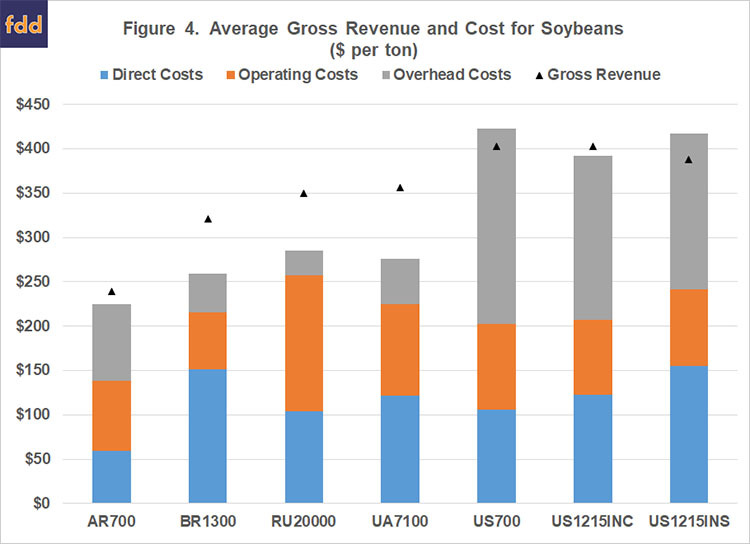 Examining the competitiveness of soybean production in different regions of the world is often difficult due to lack of comparable data and agreement regarding what needs to be measured. To be useful, international data needs to be expressed in common production units and converted to a common currency. Also, production and cost measures need to be consistently defined across production regions or farms. This paper examines the competitiveness of soybean production for important international soybean regions using 2013 to 2016 data from the agri benchmark network. Earlier papers used 2012 to 2014 data (farmdoc daily December 4, 2015) and the 2013 to 2015 data (farmdoc daily September 9, 2016) to examine competitiveness. The agri benchmark network collects data on beef, cash crops, dairy, pigs and poultry, horticulture, and organic products. There are 38 countries represented in the cash crop network. The agri benchmark concept of typical farms was developed to understand and compare current farm production systems around the world. Participant countries follow a standard procedure to create typical farms that are representative of national farm output shares, and categorized by production system or combination of enterprises and structural features. The analysis in this paper was comprised of seven typical farms with soybean enterprise data from Argentina, Brazil, Russia, Ukraine, and United States. The Russian farm did not produce soybeans in 2013 and 2014, and the Ukraine did not produce soybeans in 2013. All of the farms analyzed also produced corn. For information pertaining to corn production see Purdy and Langemeier (farmdoc daily June 1, 2018). It is important to note that soybean enterprise data is collected from other countries. For more information, visit the agri benchmark website. These five countries were selected to simplify the illustration of costs and discussion. The farm and country abbreviations used in this paper are listed in table 1. Typical farms used in the agri benchmark network are defined using country initials and hectares on the farm. There are six U.S. farms with soybean production in the network. The three farms used to illustrate soybean production in this paper are the Iowa farm (US700), west central Indiana farm (US1215C), and the southern Indiana farm (US1215S). Although yield is only a partial gauge of performance, it reflects the available production technology across farms. Average soybean yield for the farms in 2013 to 2016 was 41.7 bushels per acre (2.81 metric tons per hectare). Average farm yields ranged from approximately 20.6 bushels per acre for the typical farm in Russia (1.39 metric tons per hectare) to 55.5 bushels per acre for the west central Indiana farm (3.74 metric tons per hectare). 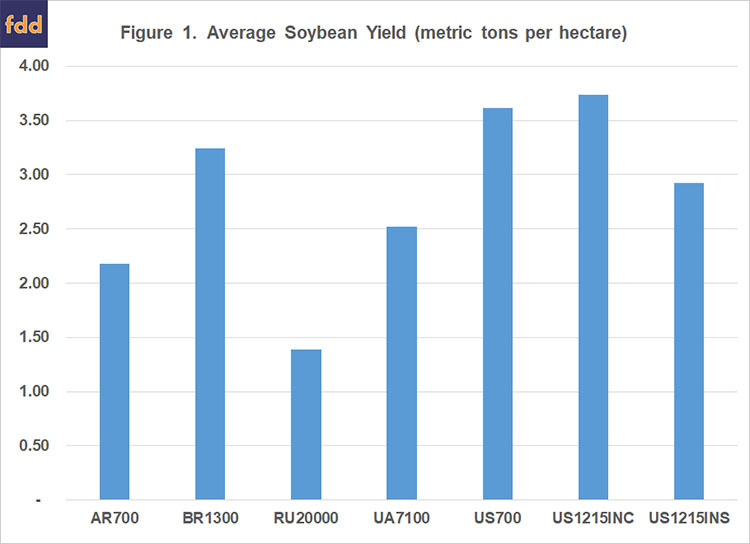 Figure 1 illustrates average soybean yield for each typical farm. It is important to note that the southern Indiana farm contained both full-season and double-crop soybeans. Due to differences in technology adoption, input prices, fertility levels, efficiency of farm operators, trade policy restrictions, exchange rate effects, and labor and capital market constraints, input use varies across soybean farms. 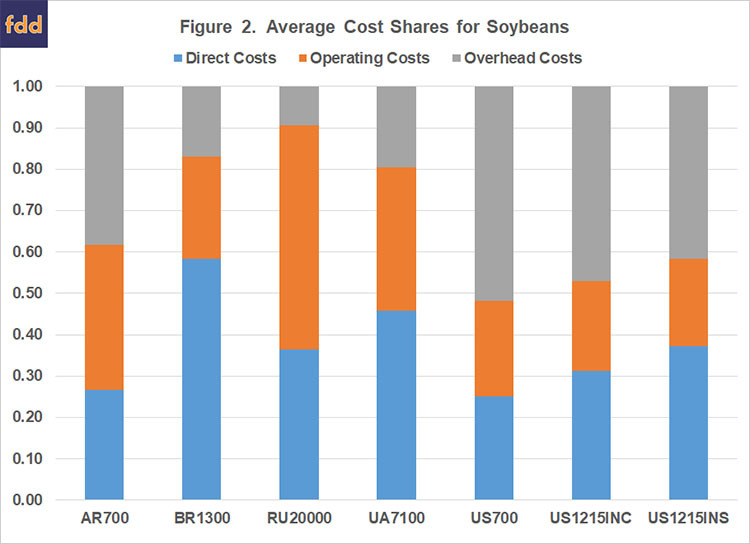 Figure 2 presents the average input cost shares for each farm. Cost shares were broken down into three major categories: direct costs, operating costs, and overhead costs. Direct costs included seed, fertilizer, crop protection, crop insurance, and interest on these cost items. Operating cost included labor, machinery depreciation and interest, fuel, and repairs. Overhead cost included land, building depreciation and interest, property taxes, general insurance, and miscellaneous cost. The average input cost shares were 37.3 percent for direct cost, 30.6 percent for operating cost, and 32.1 percent for overhead cost. The Iowa farm had the lowest average cost share for direct cost at 25.1 percent and the highest average cost share for overhead cost at 51.9 percent. The southern Indiana farm had the lowest average cost share for operating cost over the time period at 21.2 percent. All of the U.S. farms had had below average cost shares for operating cost, and an above average cost share for overhead cost. The relatively large cost share for overhead cost in the U.S. reflects, in part, our relatively high land cost. Figures 3 and 4 present average gross revenue and cost per hectare and per ton for each typical farm. Gross revenue and cost are reported as U.S. dollars per hectare. Soybeans are a major enterprise on all of the typical farms presented in figures 3 and 4. It is obvious from figures 3 and 4 that gross revenue per hectare and per ton are substantially higher for the U.S. farms, particularly the Iowa and west central Indiana farm. Gross revenue for the U.S. farms ranged from $457 per acre ($1,130 per hectare) for the southern Indiana farm to $606 per acre ($1,497 per hectare) for the west central Indiana farm. Cost per acre, cost per hectare, and cost per ton were also higher for the U.S. farms. The only typical farms that did not earn an economic profit producing soybeans during the 2013 to 2016 period were the southern Indiana farm and the Iowa farm. Average losses for these farms were and $22 per acre ($55 per hectare) for the southern Indiana farm and $25 per acre ($61 per hectare) for the Iowa farm. The west central Indiana farm realized profits of $18 per acre ($45 per hectare). Average economic profits for the typical farms in Argentina, Brazil, Russia and Ukraine were $15, $83, $38, and $69 per acre, respectively. It is important to note that despite have relatively low yields, the Russian farm was profitable. Also, with the exception of the Argentine and Ukraine typical farms, the typical farms had higher soybean profits than corn profits. 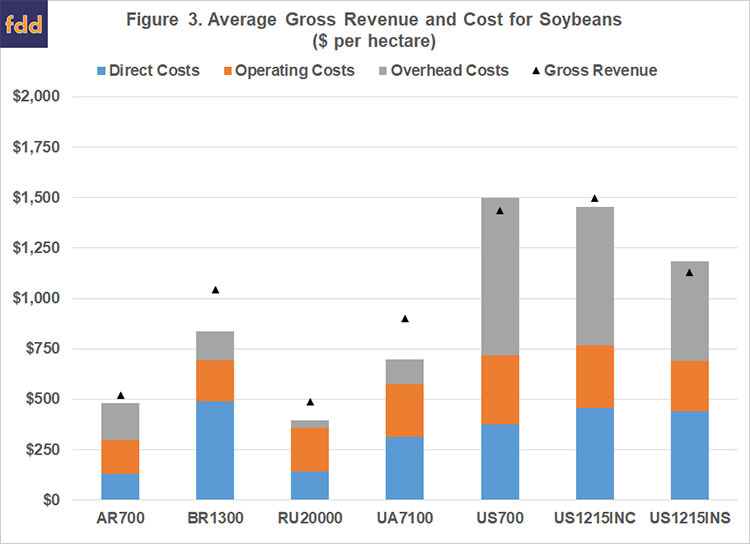 This paper examined yield, gross revenue, and cost for farms with soybeans in the agri benchmark network from Argentina, Brazil, Russia, Ukraine, and United States. Yield, gross revenue, and cost were substantially higher for the U.S. farms. With the exception of the Iowa and southern Indiana farms, every farm analyzed realized economic profits over the 2013 to 2016 time period. agri benchmark. http://www.agribenchmark.org/home.html. Retrieved on 5/29/18. Langemeier, M. "International Benchmarks for Soybean Production." farmdoc daily (6):171, Department of Agricultural and Consumer Economics, University of Illinois at Urbana-Champaign, September 9, 2016. Langemeier, M. and E. Lunik. "International Benchmarks for Soybean Production." farmdoc daily (5):225, Department of Agricultural and Consumer Economics, University of Illinois at Urbana-Champaign, December 4, 2015. Purdy, R. and M. Langemeier. "International Benchmarks for Corn Production." farmdoc daily (8):100, Department of Agricultural and Consumer Economics, University of Illinois at Urbana-Champaign, June 1, 2018.